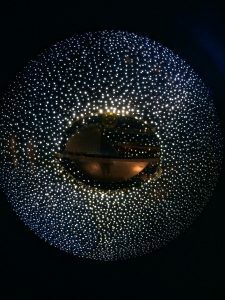 Image: La Ciudad Hidroespacial (The Hydrospatial City), detail, hanging installation by Gyula Kosece, acrylic, paint, metal and light. Photo taken by author at the Palm Springs (CA) Museum exhibit, December 2017. This Full Moon, at almost the exact moment of Equinox, inserts an exclamation point at this major seasonal turning point of the year. You might remember that there was a Full Moon exclamation point at the Solstice Full Moon last December. Two seasonal exclamation points in a row now—wow! This is special. Is your world shifting in some irrevocable way? It’s a new season, a new day, a fresh, unprecedented field of energy that stretches ahead of us. And there is more— indeed, a rather spectacular cosmic switch is turned on, as the Sun joins and the Full Moon reflects its light altared by Chiron, the Holistic Quantum Shapeshifter. Chiron activates alternate, inclusive perspectives that unite the mentality of the brain with the heartbeat resonance of love-wisdom. If you want to amp up your own potential to thicken your corpus callosum, the largest white matter structure in the brain, and improve interactive circuitry between left and right brain hemispheres, move both of your open-palmed hands back and forth in front of you. Playing drums, poi ball spinning, qigong, tai chi and other modalities that involve movement crossing the body may appeal. Also present is Salacia, Queen of the Mer People, who makes the sun to sparkle on the sea, an amazing goddess presence. As you may know, I’ve been very interested in cosmic mermaids lately, and this Full Moon validates my interest. Being a newly discovered planetoid in the river of small icy bodies in the distant Kuiper Belt, I imagine her smiles create a shimmer in the incoming fluid plasma waves, sparkling with subliminal light from the star field and the central life source in the heart of our galaxy. “Sonoluminescence” means Sound into Light! What a great word! Experimentation is showing that the sound frequencies of stars produce geometric patterns as well as light. Perhaps Salacia sings mermaid songs to make the light dance on the waves. Plasma carries the electric currents which create the magnetic field of the galaxy. Charged particles move in spiral orbits with this field. Another great word, “magnetohydrodynamic” energy,’ refers to a fluid combination of electro-magnetic and physical forces as described by experimental electrical engineer and plasma physicist Hannes Alfven, 1970 Nobel Laureate. Space is alive with plasma and electromagnetism, “filled with a network of currents which transfer energy and momentum over large or very large distances,” he wrote. Huge amounts of energy can be converted, stored and released by cosmic plasma. “From the smallest particle to the largest galactic formation, a web of electrical circuitry connects an unifies all of nature, organizing galaxies, energizing stars, giving birth to planets and, on our own world, controlling weather and animating biological organisms. Thee are no isolated islands in an electric universe,” write David Talbott and Wallace Thornhill in Thunderbolts of the Gods. A recent conference on the Electric Universe addressed the influence of electromagnetic fields on life, perceptions perfectly aligned with our new 7-year dual Chiron and Uranus cycle. Dr. Jerry Tennant is a pioneer of electromagnetic therapies, mapping the body’s energy in an interconnected series of streams. Vermont-based Eileen McKusick is another such pioneer, using tuning forks to identify and ease traumatic memories held in the biofield surrounding the body’s physical contours. Listen to her talk here. Uranus is digging into Taurus now and for the next seven years, a phase that will impact our basic, physical experience, even as Earth’s magnetosphere is buffeted by strong electro-magnetic waves, as discussed above. I’m just learning about plasma physics and the electric universe, still controversially outside accepted physics, as is Nassim Haramein’s Unified Field Physics. But I get the idea that with these incoming waves, like a huge tidal wave, we are experiencing the living energy of our planet Gaia evolving, demonstrating changes that become increasingly evident. We are compelled to ground these energies as if we are lightning rods, as our own bodies are impacted. Find your strength. Stand your ground. We’ll be in this phase, experimenting and discussing it for years to come. [Note] I’m offering a webinar, Earth Awakening, to zoom in on your particular relationship to this new Uranus phase—see listing/ register here. Mars is in Taurus until the end of March. Make good use of your resources. Stabilize your finances. Continue to take advantage of pragmatic grounding impulses, creatively and emotionally charged under this Full Moon by Venus in Leo. Express Love. Claim your Beauty. Appreciate yourSelf and everyone around you in the mirror of life. Mercury is still retrograde for another week (turns forward on the 26th), encouraging as much rest and relaxation as possible to calm and recharge your nervous system. Also for meditation and prayer, dreaming and envisioning, uplifting music and poetry to turn anxious worries into a positive channel. This is a big piece of work these days, that might require turning off information streams that foster this anxiety. Just say no! turn the dial to another channel. It is about strengthening our individual state of consciousness with positive vibes to radiate into the collective. Clear the old tape decks. Design a new play list. Here is one more turbo-charged combothat we ignore at our peril. The intensifying alignment of definitively Saturn with transformational Pluto and the Moon’s South Node in Capricornis bringing stuff forward from our collective history—many levels of dark stuff, both individual and collective, that is absolutely necessary to acknowledge, bring into the light and purge. Old “stuff”—ancestral? historic? unforgiven?— attitudes, regrets, beliefs, self concepts, etc. )—can get in our way blocking growth and forward movement. In what ways do you feel like a root-bound plant in too small a pot? At the same time, we can pull on our experience from the deep past, bolstering us with the capability to look these things in the eye and resolve them. Intimately involved with new developments is Chiron’s mythic spouse, Chariklo, who teaches how to flow with the waters of life, rather than resisting destiny. Adaptability and preparation engage creativity to meet any exigency, as we stand at the ready to respond to our calling. What does this mean to your current experience and interpretation of what is going on around you? A major phase is being completed, as we prepare to move on into a brand new opportunity. Who and what situations are disappearing behind you, as you move forward with increasingly clear resolve, simplifying your life, marshalling your resources? * you are now ages 58-60. You deserve a reading. See special on my home page. On the latest Leading with Light podcast with the amazing Sky A’Hearn, we discuss mainly this extraordinary Equinox Full Moon.Sky leads several lovely energy prayers that amplify our intake of the information. You can listen to it on iTunes or here. Open to the potential of this exclamation point Equinox Full Moon, with its surge of cosmic energies. A time of prophecy!